I bought a pretty cool drying rack to use outside when the weather’s nice. I’d like to keep line-drying my laundry during the summer but it gets pretty damp down in our basement, so we don’t need any extra moisture. Plus, anything dried outside smells so dang awesome. 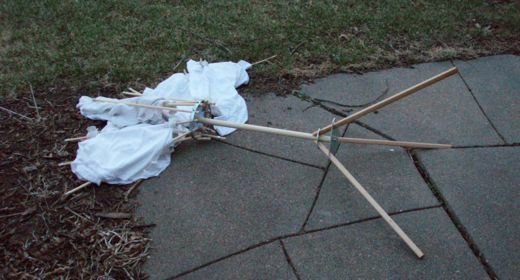 You might remember that I tried a homemade contraption last fall with disastrous results. 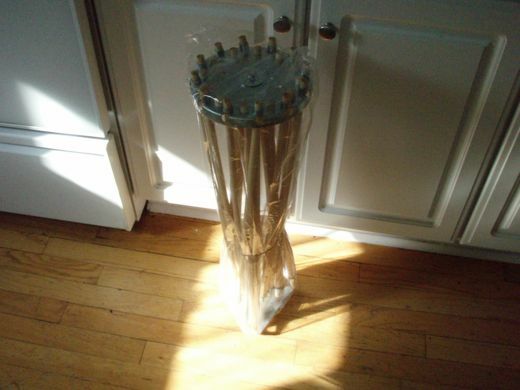 I saw this thing on the internet and had to wait a whole month before the guy was ready to sell them on his website. Finally I ordered it and it arrived on Monday. Hooray! Made of wood, built like a tank, holds at least 12 items, and sets up like a dream. 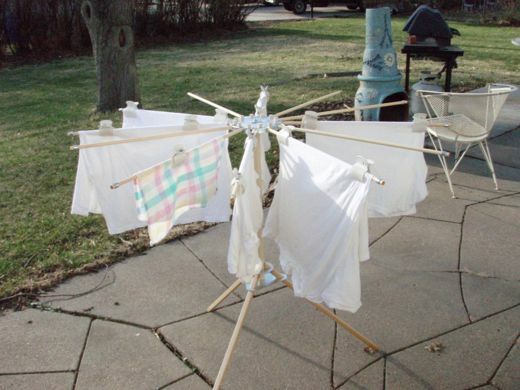 I was so excited that I quickly washed a load of whites so I could hang something up before Parent-Teacher Conferences. Yay! Clothes hanging outside! I used hair clips because it was kind of windy and the dowels are too wide for clothespins. (I don’t really want the marks from any kind of clothespin, so that’s going to have to be a prototype project.) Anyway, I made Lloyd come out and look. “Great. Wet clothes,” he said. He has no appreciation for coolness. I made him admire the ingenious design that let the gentle breeze spin the top around, like a laundry pinwheel of sorts. Um, while I was at conferences, the wind picked up a bit. Apparently it needs a little modifying for withstanding Nebraska wind. It’s construction should be exceedingly simple….. I think you should attach it to your car. Then you could just put your car in neutral and let the wind carry you along. Dry clothes and less gasoline! It’s win/win! Ha! The image of that cracks me up…and I think Lauren would be very inclined to try it. Who knows,maybe this is her way to make millions…one of you better get working on the patent. Can’t wait to see what clever way you resolve this. In Girardot in Colombia, they dry everything outside in the sun (when it’s not raining). We used to take things that had gotten a little dingy down to Girardot for some sun-clean. Everything came back full of wonderful sunshine! rats are sturdier than gerbils! unless, of course, they’re FROZEN. In defense of that very cool drying rack, the gusts of wind here were 40-50mph yesterday. It’s not usually that bad. Would stringing a clothesline or two make sense, given the blusteriness of the wind on the Great Plains? For gadgetiness, you could search for a retractable clothesline. Or build one. I’m glad you asked. I have issues with clothes lines because of a) the sagginess factor and 2) you have to use clips. In the basement everything is on (plastic coated) metal or pvc pipes, so they don’t get creases. When we first moved in we had a clothes line between the two trees out back and I would tether the cats to it. They were ‘inside cats’ and I was sure they would run into the street and die. Yes, I’m insane. Oh, yes, the sagginess factor. Ah, but I have a technical and highly gadgety SOLUTION for that, as well as one that is coated in thicker, clear and flexible acrylic. You’d love it. Cough up the info, mister. My website design class decided it would be fun to Rick Roll every link on the Lincoln Lutheran home page. Excellent idea!!! Way to go website design class! !